Mark your calendar now for the biggest and best Texas Tree Conference yet! 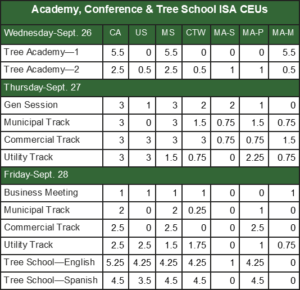 The Wednesday pre-conference Tree Academy with classroom and hands-on outdoor field stations. Online regular registration is now closed. You can register at the door. See you in Waco! Learn from national leaders in research, commercial, utility and municipal arboriculture, urban forestry and landscape architecture. Featured speakers include: Dr. Dirk Dujesiefken, Professor, University of Applied Science (HAWK), Hamburg, Germany, Dr. Kathleen Wolf, Research Social Scientist, University of Washington, Seattle, Dr. Fredric Miller, Senior Scientist-Entomology, The Morton Arboretum, Naperville, IL, Dr. Hans Williams, Professor of Forestry and Dean of the Arthur Temple College of Forestry and Agriculture, Nacogdoches, Dr. Todd Watson, Tree and Landscape Consultant, Millican, Dr. David Kulhavy, Professor, Stephen F. Austin University, Nacogdoches, Dr. David Kulhavy, Professor, Stephen F. Austin University, Nacogdoches, Dr. Raul Cabrera, Associate Professor and Extension Specialist, Rutgers University, Bridgeton, New Jersey, Dr. Linda Chalker-Scott, Associate Professor and Extension Specialist, Washington State University, Puyallup, Dr. Mike Arnold, Professor and Associate Department Head, Texas A&M University, Skip Kincaid, Director of Urban Forestry, Hansen’s Tree Service and Environmental Services, St. Louis, MO, Ben Thorpe, Transmission Utility Forester, American Electric Power, Laredo, Erik Palacios, Arborist Training- Instructor, ACRT, Donna, George Leader, Vegetation Maintenance Manager, Pedernales Electric Coop, Matthew Austin, Utility Forester/UAV Pilot, Fredericksburg, Sheila McBride, Program Extension Specialist, Texas A&M AgriLife Extension Service, Thais Perkins, Executive Director, TreeFolks, Austin, and others! Trees: A Matter of Life and Death? The Urban Forest and Community Economics: Money Does Grow on Trees! What Size Tree Should I Plant? Start at ground level to get to the root of tree protection. Discover the latest dirt on modifying urban soils. Construct constructive tactics to avoid construction damage. Identify concrete solutions for trees surrounded by concrete. Design and develop strategies to help designers and developers. These topics and more (bad jokes) will be addressed to help you create safe spaces for trees and better preserve trees during construction. A great review or introduction to basic tree care for tree workers. This newly redesigned, stand-alone one day workshop will be a combination of classroom and field demonstrations. Topics covered will include basic tree biology, tree pruning, climbing techniques including advanced ascent techniques (SRT), tree hazard assessment and job site safety. Master instructors are Guy LeBlanc, Arbor Vitae Tree Care and Greg Church, Arborilogical Services and Mike Sills, Texas A&M Forest Service. A Spanish language workshop covering tree biology, soil science, tree selection, installation & establishment, pruning, and diagnosis & plant disorders. The class will be led by Mark Duff, Consulting Arborist, Eric Palacios, ACRT Training Instructor, Dr. Raul Cabrara, Rutgers University and Bill Green, Texas A&M Forest Service. Want to be a sponsor or exhibit?